Well, I have officially survived the 10-Hanger Project Week One. If you are unfamiliar with this project, check out my blog post and get all the deets. I will start by saying that I had to make some minor adjustments to the wardrobe… well, given that it’s only 10 hangers, I guess they would be considered major adjustments, but I think I’ve finally got it figured out now. See, when I started the project, I chose items I thought I could make great combinations with. The only problem was the timing: I decided to do this right when the seasons were changing, so I chose some items I haven’t worn since last fall. Well, over the summer I completed the Insanity Max 30 Program with my friend Michelle and we kicked the crap out of it! 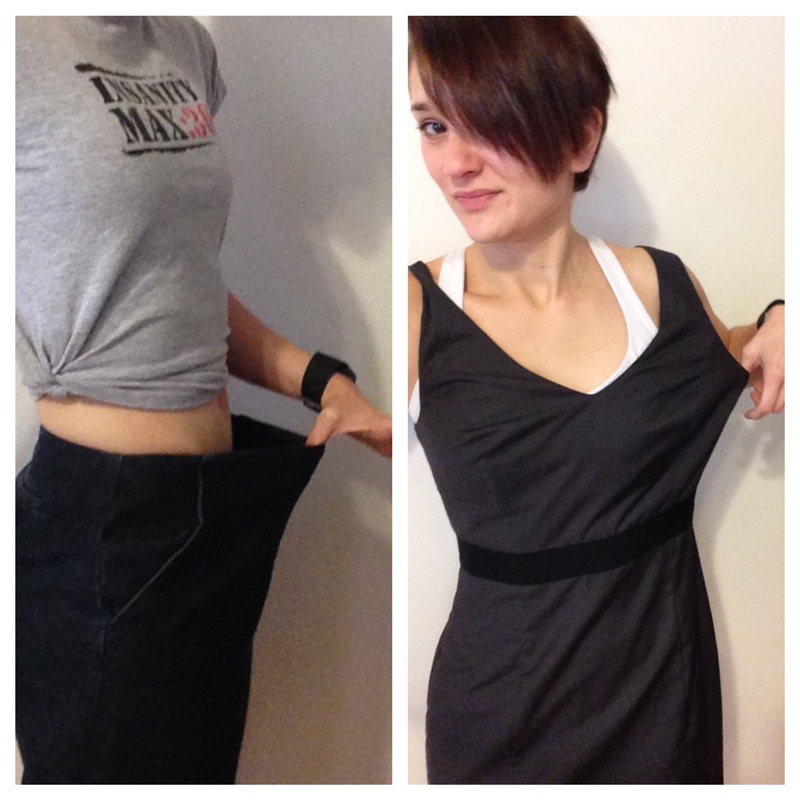 I lost almost 2 inches around my waist, and I wasn’t even trying to! All I wanted to do was tone up a little and work out with my friend– I had no idea I even HAD 2 inches to loose around the middle! I guess a terrible last year of teaching made me stress-eat and gain some extra pounds that I didn’t realize, or maybe I just toned up more than I thought. Anyway, right after that, I started the P90X 3 program, which I am ALMOST done with (check out my November goals— I’m so close to completing that one!). I haven’t taken measurements, but I’m guessing I lost some flab and toned up with this program as well. ***Note to self: try on the clothes before you decide to wear them for 30 days straight. So, I swapped out and put the baggy clothes in the donation pile . You can see that they are vey similar to the previous ones. 1.) Don’t keep clothes that don’t fit. Even if they are just a tad too loose or a tad too tight, you’ll feel uncomfortable every time you wear them, and you should feel great in every item you own. 2.) Do an in-depth closet evaluation at the beginning of each season. This will help you get rid of things that may not work with your style anymore, or things that don’t fit right or have stains, holes, or too much wear. Just because you loved it last fall doesn’t mean it’s salvageable this fall; just because you lived in it last summer doesn’t mean it’ll work for you this summer. 3.) If you have clothes that are very similar, get rid of the ones you like least. There is no use having 5 of the same gray tee shirt or 3 black skirts. Choose the one that is the most flattering, makes you feel the best, or is the most versatile. Donate the rest, especially if they no longer fit (like in my case)! 4.) Don’t be afraid of failure. This isn’t so much a wardrobe tip as it is a life tip. If I was going by my own rules, I would have just stuck it out and worn the clothes that don’t fit me. It honestly made me fearful to share this failure with you because I felt like I was cheating– I didn’t get this project absolutely-positively-perfectly-right. But the point of this entire 10 Hanger Project is to get rid of my attachment to clothes. There may have been a time when I would have noticed that the dress and the skirt didn’t fit right, but still tried to keep them and make them work because I was attached to them. One of two things would happen: 1.) they would have hung in my closet, never getting worn, or 2.) I would have worn them, and felt awkward and uncomfortable the entire time (I probably would have looked pretty awkward too!). No, no no. This time, these babies are gettin’ tossed! I failed at picking out the very best 10 items for my project. I failed. It’s okay. Fix it. Be flexible. Move on. Breathe. Not bad right?! See, I don’t need new clothes! In fact, I only need a few. But I’m not going to lie, laundry has been a doozy… Now I know what it feels like to have LITERALLY nothing to wear by the end of the week! Thanks for tuning in with me as I journey on this minimalist mission this November! What do you think would be the most challenging thing about whittling your wardrobe down?